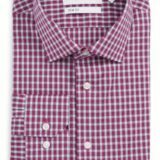 Fashion-conscious men are always looking for dress shirts to turn heads while out and about. 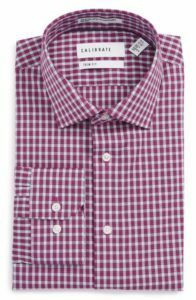 Nordstrom Calibrate Slim-Fit Dress Shirt, is one of the leading names within the industry. The addition of their Calibrate line should appeal to many males. Let us take a look at what you can expect. This shirt is available in a neutral tone; a melange of blue and traditional grey. It is therefore perfect for more formal occasions. The addition of white dots helps to punctuate this hue. A wider collar is also great for those who are looking to accentuate their shoulders. This shirt is all about comfort. It is fashioned from pure cotton, so breathability is never an issue when the temperatures begin to rise. Sleeve buttons can be adjusted when needed. Its cutaway collar is great when worn in combination with a tie. A curved hem and a back yoke offer a rather formal overtone. Smooth stitching will not chafe the skin. Sizes from extra-small to extra large are available. The Nordstrom Calibrate is currently priced at £75 pounds (€89 euros). While this is not necessarily an expensive choice, it is certainly more costly than other models. The main reason for this observation is the fact that it is imported and it incorporates a pure cotton construction. The only major issue that we had with the price was that the shirt is available in a single colour. This could prove to be a bit frustrating to those who were hoping for a wider array of tones. Price and value are obviously two different concepts when referring to modern fashion. The fact that this is a Nordstrom shirt certainly makes a difference in terms of home and office wear. Its all-cotton manufacture is also notable. Cotton is a material that will last for quite a long time without fraying or shrinking if cared for properly. There is no doubt that the shirt can be looked at as a one-off investment. Still, most men should not find its cost to be a deciding factor. In terms of overall value, the Nordstrom Calibrate is at or near the top of many fashion review lists.